Will ordinary Vitamin B1 and B12 work just as well? It has been known for some time that increased levels of Thiamine (vitamin B1) in the blood stream are very effective in supporting the nervous system. Unfortunately, the oral intake of vitamin B1 does not greatly increase the levels of B1 in the blood stream. Previously, the way that blood stream levels of B1 were increased was through periodic intravenous feeding or through injections every few weeks. The reason that methods like this had to be used is that Thiamine (sometimes spelled Thiamin), like all of the B vitamins, is water-soluble. Thiamine cannot be stored in the body and flushes out within 4 to 5 hours. Oral intake of Thiamine over 5 mg results in greatly reduced bioavailability and immediate flushing from the body (this is why urine frequently turns yellow when taking larger doses of B vitamins). If you have any questions about interactions with any other drugs, vitamins, supplements, or therapy, consult with your physician. 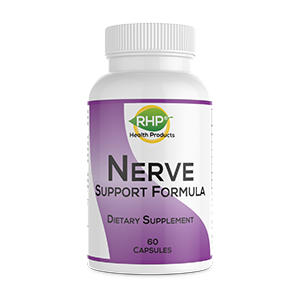 What is the difference between the Nerve Support Formula that has 120 capsules in it and the Nerve Support Formula that has 60 capsules in it? We found out by doing a survey that an overwhelming number of customers would love to take less capsules and get more ingredients in each capsule. The Nerve Support Formula had 120 capsules in each bottle. The serving size on the bottle was 2 capsules. The Extra Strength Nerve Support Formula had 60 capsules in each bottle. The serving size on the bottle was 1 capsule. The ingredients are exactly the same between these two products. It is simply twice the amount of ingredients in one capsule. We have now made Extra Strength Nerve Support Formula the new standard Nerve Support Formula. Your order is processed and shipped out the day we receive it or latest by the next business day. It is shipped by First Class Mail and normally takes from two to four business days to arrive within the continental USA.